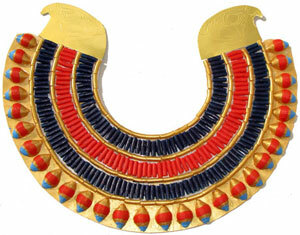 Year 5 children created these collars to wear during an ancient Egyptian class assembly. They are very simple to make; take a large paper plate and cut out a hole for the neck and a gap at the back. We looked at various examples of ancient Egyptian collars and jewellery which inspired the young artists to create their own designs using watercolour paints. Apply some extra detail with metallic paints for some added bling! Year 5 worked in groups of 6 to create these life-size, mixed media, sarcophagi/ sarcophaguses! Start by asking one child and geting them to lie on a long, thick strip of paper. Get other children in their group to draw an outline around them. Divide up the shape into 6 equal parts and, using thin, small candles, ask the children to draw designs inspired by hieroglyphics and ancient Egyptian coffins. The children then use watercolour paints to paint over the wax with bright, colourful designs. This technique is called wax resist. Make sure that lots of paint (not too watered down), is applied as this will ensure that the wax really shows up. Finally, give the children oil pastels to add more detail to their designs. I ordered this papyrus online, although you can make your own version from scratch of course! My class created these sacred animal images using black pens and pastels.